The Crankshaft Trolley has been designed and manufactured for a large west midlands based automotive OEM. The crankshaft trolley allows safe transportation of crankshaft parts, at all stages of the machining process, for any engineering or safety purpose that requires the material handling of such parts via manual trolleys. This kitting solution transports components in a non-metal to metal environment keeping them secure during transportation. The layout of the trolley allows flexible kitting across a number of product groups. The trolley framework will be constructed from 40mm square box section with a bent up 25mm circular hollow section handle at one end. The frame features two off locations at 452mm (W) and 637mm (W) apart for use with differing length crankshafts. The design features two rails that will run along the length of the unit which sit 2 off machined nylon components with 10 off cut out V’s. Below this a drain-able drip-tray has been incorporated to capture any swarf or liquid from these parts. The trolley is assembled with 4 off 160mm castors with blue elastic tyres and black plastic centres, 2 off swivel with brakes and 2 off fixed. 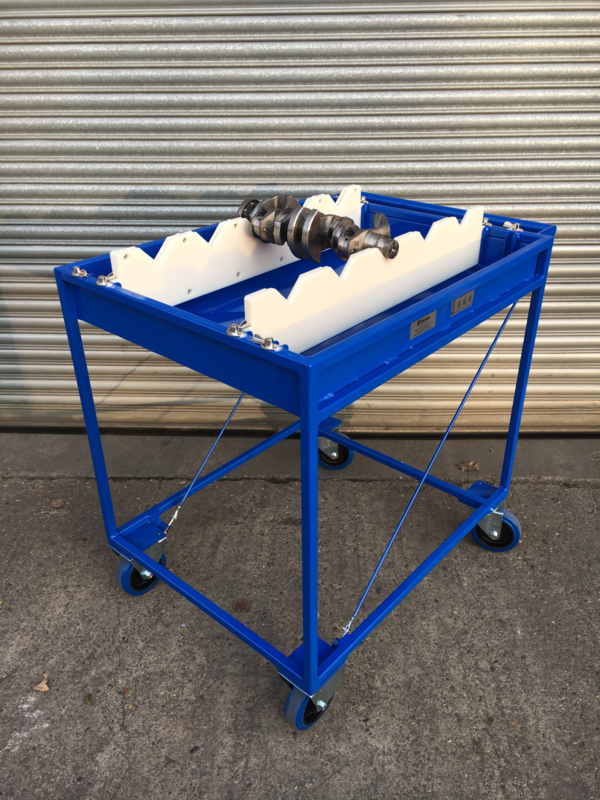 The trolley has been powder coat finished in RAL 20D45 Blue to give a hard wearing durable finish. Approximate overall size- 1100mm (L) x 650mm (W) x 780mm (H).